Berkley's 7" Soft Grip Fillet Knife is perfect for cleaning most midsize species. This knife features a corrosion resistant 420 stainless steel blade which provides sharpness and strength. Berkley's Soft Grip Fillet Knife has an ideal blade flex for fast and easy filleting. 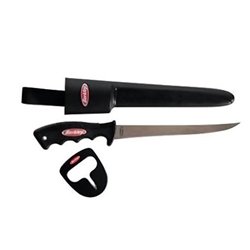 This knife also comes with a quick and easy to use sharpener!